Before I had featured a dish called Chicken, Lychees, Grapes and Pineapple Red Curry and it was something that we had tried in a restaurant called Tip Siam in Takapuna, we so liked their dishes and imitated several recipes at home as they were so delicious and highly recommended. For today we will be trying to make a dish called “Gang Ka Min Num Peung” or Chicken marinated with turmeric powder, potatoes, bananas, eggs and honey in coconut milk. Unlike the first dish we had featured this is a bit hard to make because our only hint was the ingredients listed on the menu we found online and though I remembered how it tasted I can’t remember them all and was a bit confused at the eggs. I cannot recall that there was an egg on the one we ordered so I asked my daughter and wife if there was an egg in the said dish, they said there’s none so I searched online and check whether there is a type of curry where egg is mixed in the sauce similar to how eggs are mixed in carbonara but there was none so definitely it must be included in the dish as hard boiled as there are several curry variant that include hard boiled eggs in the recipe. Another confusing part for me is that on the menu it says “Marinated on turmeric powder”, well I think that’s not enough to make curry so I opted to use the normal curry powder which contains an ample amount of turmeric anyway the taste is nearly similar to the Philippine chicken curry which uses the common curry powder. Now what was the result? Well it tasted nearly the same but a bit sceptical whether we had used the same ingredients, anyway what’s important is that the result was as delicious as what we had tried. If you are intrigued about the taste well it’s a good combination of different flavours true to Thai cuisine, the creamy coconut milk over honey and hints of banana is a good base flavour for chicken, at first we were a bit hesitant when we ordered it but when we had our first spoon it was a magical combination of flavours. In a wok add oil then sauté garlic and shallots, once shallots are soft add chicken and continue stir frying for 3 minutes. Add potatoes and 2 cups of coconut milk bring it to a boil and simmer in medium heat for 15-20 minutes, at this stage the liquid should be thicker and reduced. Add remaining coconut milk, chillies, honey and banana then simmer for 3 more minutes. Season with fish sauce then serve with halved eggs. Himself isn’t keen on frut in his meat dishes, but for me it certainly looks interesting! What type of bananas did you use? Interesting combination of flavors! Are the red chilies the component that pulls all of them together? Lovely photo too! Another great curry Raymund! The addition of the banana and egg sounds very interesting! My mind is saying you don’t even like bananas, and my mouth is still drooling. Look at that egg! 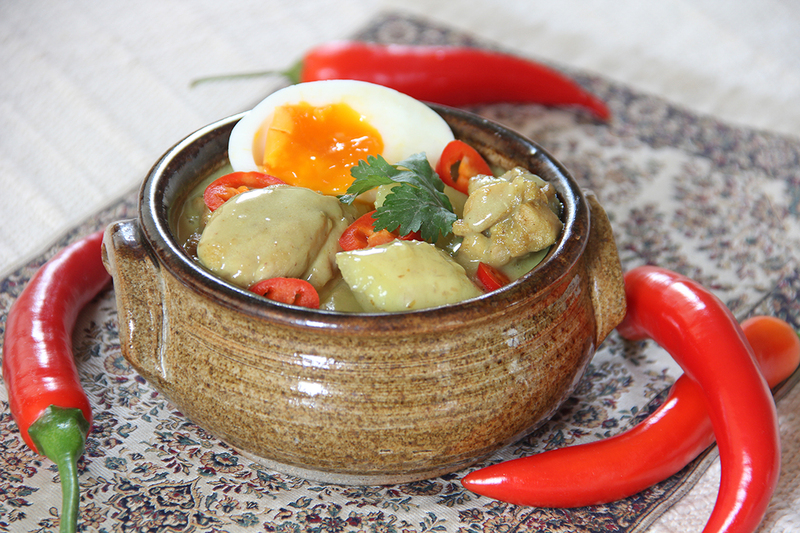 Bananas, honey and chicken sounds like a great combo…then eggs, coconut and curry. Fantastic flavors no doubt! Really interesting post – I enjoy reading about the process behind recipes. This looks like a fabulous curry. You don’t see that many where bananas and eggs are combined – sounds wonderful. Sounds interesting – I’ve found there are many savoury dishes using bananas when I was in the Philippines and they tasted great so I’d be keen to try this. As for curried eggs, I used to have them for supper as a child so I’m quite aware of how good they taste! sounds like an interesting flavor combo! I have never tried Banana with chicken for that matter with any meat.. Need to try this sometime. Your photo looks so delicious, I love how your egg looks with the yolk not quite cooked through. I’ve never heard of a honey Thai dish but I love the idea – especially as a match with the sweet of the bananas and the savory from the chicken and egg. Plus those chilies look awesome.